The characters of The Hunger Games all have dirty fingernails. This is the primary insight to be intuited from director Gary Ross' incessant close-ups on the dirtied children culled from futuristic districts to fight each other to the death in a lasting reminder of the cost of rebellion. Sadly, fingernails are about the only thing I could make out in frenzied maelstrom of splintered images Ross assembles in sub-Bourne fashion. He's dealing with tricky material—the grisly killing of adolescents for sport—and forced to deliver a PG-13 rating to boot. He responds with a form of compromise: he gets to show teenagers dying horribly by making their demises so utterly incoherent that one cannot be sure anything's happened at all until the camera shows the tiniest splash of blood. The shakycam mania of Ross' direction frustrated me more than usual because, to my surprise, I found myself engaged by the material. I haven't yet read Suzanne Collins' source novel, though I went straight to the nearest bookstore afterward to pick up a copy. Perhaps in her prose I'll find a more nuanced treatment of the themes, one that gives any kind of space to the material and lets the true horror of the titular games sink in rather than be roughly pushed along with all haste. And if nothing else, I'd like to get a fuller portrait of Katniss Everdeen (Jennifer Lawrence), the insipidly named but instantly memorable protagonist who seems to be locked into opposition with certain sexist trends in young female characters as much as she is 23 other teenagers. Lawrence mines the Ozark-hardened toughness of her Ree Dolly from Winter's Bone in portraying Katniss. The two characters even share a certain common ground: both come from rural, hilly areas suffering from extreme poverty, and both must care for their young siblings and deadbeat mothers after losing their fathers to the harsh realities of their homes. The Capitol's deliberate neglect, even punishment of District 12 does not seem too exaggerated a change from the neglect shown to our present Ozarks. (After reading the start of the book after seeing the movie, I see that District 12 is actually set in what was once Appalachia.) One look at this young woman, even before we see her effortlessly shooting down birds with a bow, and it's clear she is independent, resourceful and strong. So emotionally tough and protective of her family is Katniss that when her 12-year-old sister, Primrose (Willow Shields), is selected to compete in the 74th Annual Hunger Games, Katniss makes a nearly unprecedented move in volunteering in the girl's place. The event where this takes place, the Reaping, is the film's highlight. When Ross cuts to third parties in the rest of the film, he tends to show the audience the Capitol perspective, that of the screaming, bloodthirsty mob rapturously tuning in to the violence. But the Reaping is quiet and grim, the air static with fear as a tarted-up member of the Capitol (Elizabeth Banks, unrecognizable with so much powder and eye shadow on that she can barely open her eyes) takes the stage to pull a male and female name from bowls. Despite the speed with which the film arrives at this moment (to say nothing of everyone knowing what's about to happen), the calling of Prim's name is a gut-punch, to the point that one cannot recover in time to cheer for Katniss stepping in for her sister. The respectful silence that meets Katniss' sacrifice is likewise more powerful than the wildest cheering of adoring Capitol fans. It's the one dose of somber maturity before the film moves into the disgusting realm of the Capitol and the lesiure class that resides in it. The Hunger Games themselves are clearly extracted from our current fascination with violent sports and reality television. Before the Reaping, Katniss' friend Gale (Liam Hemsworth) says, "If no one watches, they don't have a game," but his words sound naïve even in this world, where so many already say the same of the Kardashians or Charlie Sheen. "It's a television show," cautions one character, and it certainly functions like one. 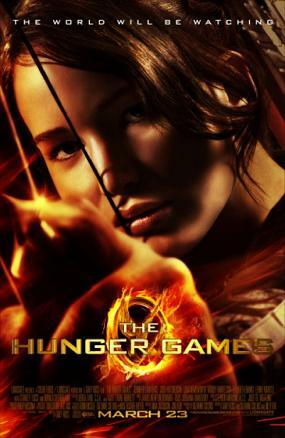 When Katniss and District 12's male tribute, Peeta (Josh Hutcherson) arrive at the Capitol to begin training, they are mentored in fashion and personality as much as survival skills and combat; the slogan of the Hunger Games is, "May the odds be ever in your favor," but it soon becomes clear that winning the hearts of the public can help tip those odds. All that's missing is Ryan Seacrest cutting to a series of increasingly infuriating commercial breaks. These pre-Games scenes in the Capitol (as well as returns to the Capitol during the contest) mercilessly skewer fascination with unknowns thrust into instant celebrity and the way that the government utilizes that simpering mob love to maintain order. Some of the best scenes involve Seneca Crane (Wes Bentley), the gamemaker, and President Snow (Donald Sutherland), discussing the implications of Katniss' resonant popularity. Crane, who thinks of the ratings, loves the attention she gets, arguing, "Everyone loves an underdog." "I don't," responds the tyrant instantly, and for obvious reasons. So long as the Games are a cynically jubilant affair emceed by a stiff-coiffed, bleach-toothed crowd-pleaser (Stanley Tucci), they keep the crowds docile. But when players start breaking the rules and influencing viewers, everything can change. If I say that I enjoy so much of what goes on outside the limits of the arena more than the Games themselves, that is because, again, the event is shot so spastically that it is impossible to get anything out of them. By using the flurry of editing and handheld close-ups to prevent the audience from getting a disturbing, full view of a child's death, the director also robs the carnage of its emotional impact. He's right to think that actually seeing a child be murdered by others his or her age would be repellent; that's the point. Instead, the violence is divorced from its meaning, allowing the film's audience to largely play the role of the gawking Capitol crowds watching on their own big screens, rooting for their favorite to emerge the champion. Compare the visceral rush of the carnage in the area to Woody Harrelson's character, Haymitch, a former winner of the Games. Some of the other kids fighting against Peeta and Katniss are presented as so haughty and sadistic that one can only hope for their deaths, but the ostensibly comic bitterness and alcoholism of Haymitch shows the endpoint of victory in these Games. He's the only true insight into the psychological effect of murdering up to 23 people for the delight of a crowd, and he's presented as comic relief. It makes me pine for the wonderful finale to the Harry Potter film franchise, in which Rowling's post-battle celebration was replaced with a solemn mourning for the dead and a vacant, ragged sense of relief tacitly shared among the survivors. It displayed a respect for the dead sorely needed here, not merely to give the deaths weight but to underscore Katniss' efforts to rise above this abhorrent system. Even the act of defiance that closes the 74th Annual Hunger Games lacks the force it should because of the meaninglessness what's happened in the arena. Ross ends up treating Katniss not as the character she is but the icon she's become, and in so doing he robs The Hunger Games of the darkness and tension it is clearly meant to elicit. There should be no sense of joy in Katniss' quest, even if she makes it out of that arena alive; sadly, The Hunger Games is so ready to rejoice in its protagonist's victories that it wastes its terrific premise. I read an interview with Ross where he was asked about the shakycam, and he responded as though the question was stupid, the answer self-evident: "Because I wanted a subjective point of view." It's a sure sign of contemporary Hollywood's creative literalism that filmmakers think that shaking a camera is the only way to convey subjectivity. Ross, who established his bonehead bona fides with his History Channelesque adaptation of Seabiscuit, is certainly a leader of the Literalist Front. Craig, that's a depressing anecdote. Having freshly watched my first Rohmer film, I have that director's gorgeously formal, subtle use of subjective filmmaking still on the brain, and to see this incoherent literalism touted as the only way to communicate a character's feelings is depressing. Hell, has he never even heard of Brian De Palma? Wow. That quote upsets me. Looks like I'll just get to keep showing Battle Royale and The Running Man when I teach the novel, hehe. Well, I reserve complete judgement until I see the movie. I think you'll find that Collins -- though she becomes susceptible to the Twilight-esque love triangle stuff at times (and she definitely does this in the later books) -- is pretty adept at creating a nice gateway for teen to Lord of the Flies, especially teens that don't really like reading. The book does leave more room for the deaths to resonate and have an impact (the novel allows for discussion of things like the acceptability of violence in our society and the affects of violence...even things like PTSD...which is rare for a YA novel to deal with such issues in such a visceral way). I think you'll like it; it's a breeze to read. To speak to Craig's point, the reason the quote bothers me is because I find that Collins' novel -- despite its popularity not just amongst teens but also the teachers that have crammed the book into their curriculum the last couple of years -- sidesteps all of the pitfalls of literalism that plague YA lit. I know there are plenty of teachers out there that teach the novel the way Gary Ross thought it should have been filmed, and as an educator -- and a movie lover -- this literal interpretation of point of view saddens me. Just like the novel is so much more than JUST ANOTHER dystopian novel (although it is an effective one), the film should be more than just another poor example of the Bourne aesthetic being implemented in action movies. OK, so what's extremely stupid about that quote is that the shakycam isn't even reserved for scenes where it would help us either understand the main character's emotions or that would heighten our own sense of being "in" the movie. A perfect example: Very early in the film, there's a shot (taken from no character's perspective, so far as I can tell) of a guy in District 12 (think: the Ozarks) gnawing on some chicken. THIS is one of the shots Ross chooses to show in extreme shakycam. So what are we supposed to take from this? That eating chicken is something otherworldly that should make us feel uncomfortable? That Katniss feels overwhelmed by mundane sights in her own hometown? It makes no sense at all. Shakycam in the "Hunger Games" themselves? That makes sense. The larger problem, though, isn't the shakycam. It's the preponderance of close-ups. Save for a couple typical lazy CGI crowd shots, everything is so tightly framed that you'd think the action was shot in a small field next to a 7-11 and they were trying to keep the Slurpee machine out of the background. Jason: I nearly included a De Palma quote about using too many close-ups. They lose their effect when they are overdone. I mean, practically every conversation was shot/reverse shot close-ups. It felt like I was watching an interview for local television, not a film. Had Ross kept his distance and reserved a close-up of Rue's stunned face when she's speared, that would have been absolutely devastating despite the lack of character building. A close-up is a privilege, and Ross completely obliterates their impact because of it. So what are we supposed to take from this? That eating chicken is something otherworldly that should make us feel uncomfortable? I often feel that way when shopping for Tyson's. But seriously. Lots of great directors (Kurosawa, Scorsese, Spielberg) have used shakycams. But like lens flares, they use them sparingly, when the scene warrants it. The problem with Gary Ross - as Jason points out - and other filmmakers is they can't tell when a scene warrants it and when it doesn't. Also, it doesn't seem to occur to them that it's possible to use a handheld camera and not shake it around: nearly the entire second half of Jaws was shot with handhelds, and no easy trick keeping them steady on a boat. Occasionally I'll employ a double-standard and like a shakycam movie. Paul Greengrass, who spawned so many imitators, doesn't bother me so much because he puts some thought into how the shots are edited. The comedy In the Loop was shot with jerkycam, but it made me laugh a lot. I have to be honest, though, that I've never come away from any of these movies thinking that the shakycam made it better. The chicken scene I mentioned is really glaring, because it looks to be the opposite of Jaws. It didn't turn out shaky. It's as if Ross said, "When you shoot that guy eating chicken, SHAKE THE HELL OUT OF IT!"